If you are interested in vending at our VENDORS PADDOCK or SPONSORSHIP of Mods vs. Rockers Chicago please email Fletch at: fletch@steeltoepress.com. Vending Space is very limited and we are only interested in vendors that specialize in Vintage or Café Motorcycles or Culture. See complete vendor’s information at the bottom of this page. Thanks for being part of MOTOBLOT 2014! This email contains all the information you need to vend at our Saturday, June 14th and 15th Rally on Fulton St. at Ashland. FULTON STREET at COBRA LOUNGE, 235 N. ASHLAND AVE. Event workers, vendors, and booth staff are admitted free of charge with wristband. Your exact booth and Vehicle space will not be assigned until your arrival. Please check in with event staff immediately upon arrival to receive your information packets, passes, wristbands, and your booth assignment. Food booths and trucks will be located on Fulton St. (Reference map key). Vendor & Booth Loading starts at 6:45am and continues until 11:30am. Please check in with event staff immediately upon arrival to receive your booth assignment, parking pass, and other important information. will be able to drive directly to their booth space. Please check in with an event staff located at the corner of Ashland and Fulton to be directed to your booth assignment. Exact booth numbers are not assigned beforehand; your final booth location will be assigned on arrival. Each vendor will have about 20 minutes to drive into the lot or park in the loading zone, unload, and move their vehicle. Any Vendor that arrives later than 11:30 will not be aloud to unload with their vehicle and will have to walk everything to the available space. MOTOBLOT staff will not be available to help with loading. You must bring your own hand trucks and rolling carts if you require them as neither the venue nor will MOTOBLOT have them available. 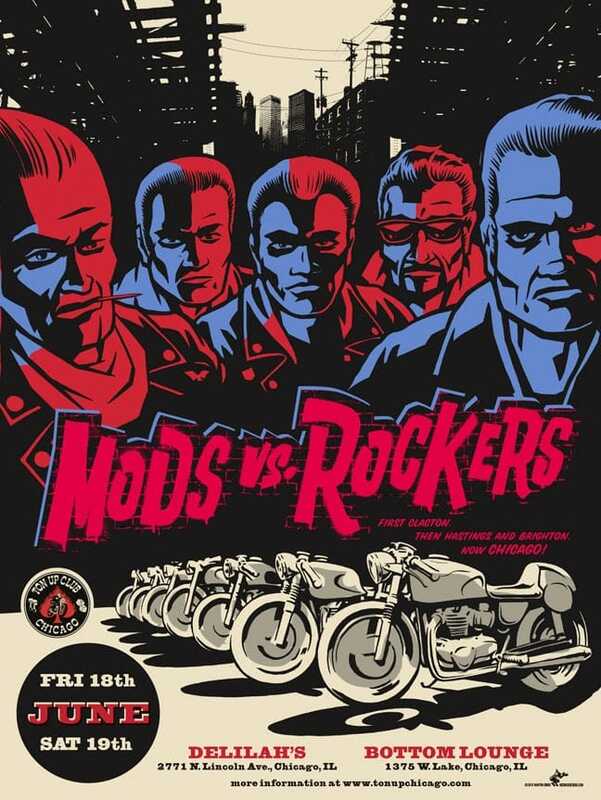 Mods Vs Rockers does not provide tents or coverings. Outdoor vendors are responsible for bringing their own canopies. There are no restrictions on the types of canopies you can bring, but please keep in mind booth dimensions (10’ x 10’) when selecting your equipment. Keep in mind Winthrop Street is concrete, so you will not be able to drive stakes into the ground. Plan to bring something (concrete blocks, sandbags) to secure your tent legs. Tents with unsecured legs will not be permitted in the event. Outdoor booths will not have access to electricity. Please email Larry at fletch@steeltoepress.com if you need access to electricity in the lot. Your parking pass and directions to vendor row will be provided to you at check-in. You do not need to print anything or bring anything to receive your parking pass. Street parking is also available, but please mind posted signs and parking regulations per City of Chicago ordinances as much of the surrounding neighborhood is parking by permit only. You do not need to obtain any special permits or licenses to sell at the Bazaar. The Vintage Bazaar applies for Itinerant Merchant Licenses for all our vendors. You are responsible for collecting Illinois sales tax (9.75%) on all items you are selling, remitting the sales tax to the State, and claiming the income you make at the Bazaar on your income tax. For more information on registering your business, call the Illinois Department of Revenue or the IRS. While we’re working hard to create a fun atmosphere for vendors and bikers alike and will be serving beer & wine during outdoor event; Alcoholic beverages will not be allowed to leave the enclosed area of the rally — for All PATRONS participating, viewing or vending — per Chicago city ordinance. Help make this event a smash by spreading the word about the market in whatever way seems fit for you.Fan and add content (including preview photos of your merchandise). Email fletch@steeltoepress.com a link to your Facebook Fan page so we can like you back! Link to our video teaser on Vimeo.